Are you looking for a Cranberry Supplement with a high concentration of oligomeric proanthocyanidins (OPCs), superior to all other cranberry materials tested (50 mg). Cran Naturelle is worth a look! Modern research shows that the OPCs and anthocyanidins in cranberry and other plants can scavenge free radicals such as the hydroxyl radical (OH-) and metal ions while protecting cell membrane lipids from oxidation. Colonial sailors used cranberries aboard ship to prevent scurvy and it worked marvelously well. Vitamin P constituents (i.e. the polyphenols and organic acids) in the berry are known to “spare” vitamin C. This means that they can fulfill many of the antioxidant roles of vitamin C, thereby leaving vitamin C free for use in tissue repair and maintenance (along with calcium, zinc, and protein.) The rich complement of nutrients in the cranberry was unknown to the early Americans, but its ability to support health was well recognized. 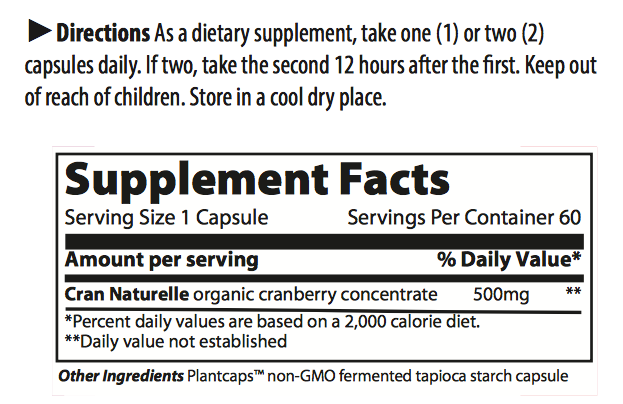 ►Directions As a dietary supplement, take one (1) or two (2) capsules daily. If two, take the second 12 hours after the first. 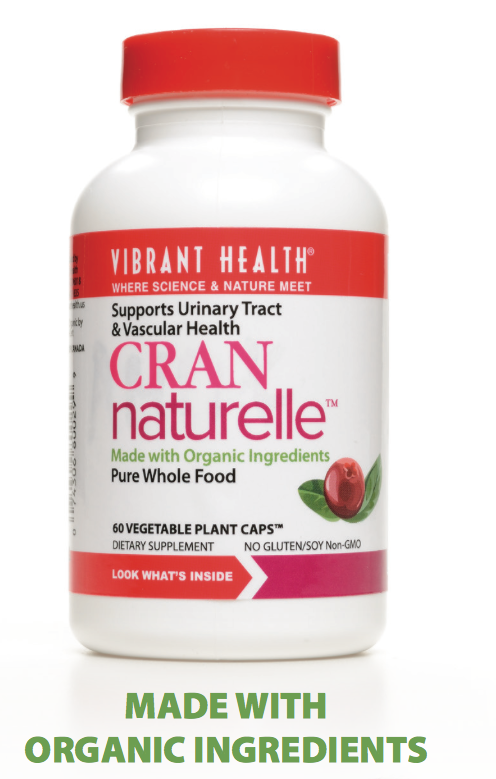 Cran Naturelle is made from 100% pure whole cranberry, concentrated through a proprietary process that condenses the nutritional value of 18.5 grams to 20 grams of fresh cranberry into one 500 mg capsule. The process enhances and intensifies the natural, beneficial constituents of the whole cranberry without the addition of sugars, preservatives, flavorings or coatings. Organic Cran Naturelle is a product of Quebec, Canada. Fruit d’Or, the manufacturer of Cran Naturelle certified organic cranberry extract, is the only cranberry company that plants, grows, harvests and dries its own cranberry product into nutraceutical grade material. Vibrant Health brings this revolutionary new 37:1 to 40:1 concentrate of whole cranberry to the United States. Cran Naturelle provides a guaranteed minimum of 10% oligomeric proanthocyanidins (OPCs), superior to all other cranberry materials tested (50 mg). Contain no fillers, chemicals, additives or excipients of any kind. Plantcaps vegetable capsules are made from fermented tapioca starch. Statistics show that 30% of women will have some sort of urinary tract infection this year. Half the women in the world will have had a urinary tract infection (UTI) by the age of thirty. Although women are more prone to this affliction, men are by no means immune. But there is hope. 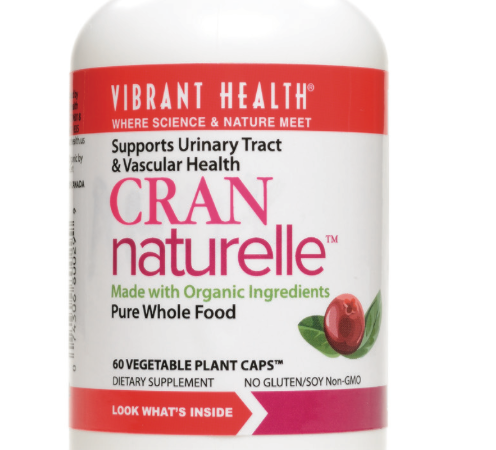 Cran Naturelle resists adhesion and cellular invasion of E. coli and other gram-negative bacteria that cause UTIs according to studies from Rutgers University and the University of Wisconsin. Rutgers University showed a 70% resistance of adhesion of E. coli bacteria on a cultured cell model of urinary tract tissue. The anti-invasion study at the University of Wisconsin showed a 74% reduction in the ability of uropathogenic bacteria (bacteria that can cause UTIs) to invade and colonize cells lining the gastrointestinal tract. This effect reduces the likelihood of future urinary tract infections. Cran Naturelle is made from the complete cranberry — the fruit solids, juice, seeds and skin. As a result, Cran Naturelle contains the full synergistic spectrum of all nutrients found in whole cranberry. Benefits derived from this unique whole cranberry extract stretch beyond those expected for urinary tract health. Polyphenols in Cran Naturelle, inhibit elastase and collagenase enzymes while tightening (condensing) collagen bonds in the lining of blood vessels, making them more resistant to oxidative damage and penetration by atherogens. The polyphenols in Cran Naturelle endow it with all the antioxidant, anti-aging and tissue repair properties we have come to recognize in similar extracts of pine bark, grape seed, pomegranate and others. What are some of those magic components in cranberries that make it so valuable? Native Americans used mashed cranberry as a dressing for wounds. We now recognize that the stanching and healing properties lie in the rich polyphenol content including condensed tannins and smaller OPCs.